When Emma Watson began her speech at the launch of the United Nation’s gender equality campaign in New York yesterday, she made a point of addressing every person in the room. Her intention, much like the campaign itself, aimed to promote unity and inclusion within the audience she was speaking to, a sense that each and every person in that room was invited to listen, regardless of their race, their religion, their ethnicity and of course, their gender. HeForShe is indeed a campaign which aims to make an immense impact on the movement towards abolishing gender inequality. What makes it unique is that both men and women are being encouraged to play a part in instigating change. 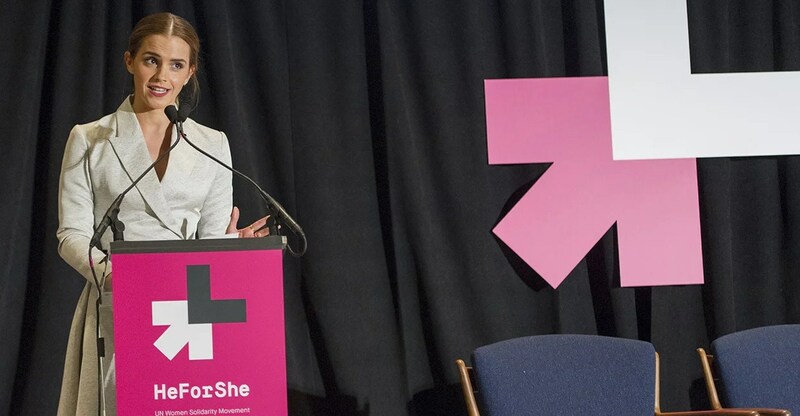 What makes Emma’s Watson’s speech especially unique is the recognition of an ironic gender imbalance in the fight towards total gender equality, as well as the negative connotations brought about to this movement by the word “feminism”. In modern society, we are graced by the presence of female ambassadors like Caitlin Moran, Suzanne Moore, even Beyoncé, who triumph feminist ideologies and encourage women to express their sexuality and female empowerment in an often male-dominated world. Caitlin Moran’s 2011 best seller How to be a Woman indeed addresses the issues of the modern woman, guiding readers both old and young through an age in which women can find themselves oppressed by society, the media and their peers. But how is a man supposed to understand and support the concept of feminism when every piece of literature written about it seems to be aimed at women? “How can we affect change in the world if only half of it is invited?” Emma Watson says. While the word “feminism” is not in any way defined by “male-bashing” or female superiority, associations with it have become too tainted to encourage any real support for the ideas it is striving to achieve. The etymology of the word itself connotes “a state of being feminine”. The “fem” part of the expression is enough to assume that it is for women only, even if this isn’t the case. Does the problem of capturing the attention of the masses therefore lie with the word itself, rather than the meaning behind it? It is this new approach that can guarantee this movement’s success, and everyone needs to be involved if any impact is to occur. It is, after all, not just women who face monumental tribulations in their day to day lives. Watson makes a point of highlighting the shocking global volume of male suicide rates, and that men can too be victimised. It will be difficult to shift the tainted reputation of the word “feminism”, but this campaign does indeed have the potential to formulate a new and successful space for total gender equality. Let’s not waste time trying to convince people what feminism actually means. Let’s instead work on what it is intending to achieve.